Ultimate Omega is a combination of EPA and DHA, the two main components of omega-3 from fish oil, are essential for growth and development throughout the human life cycle. There are many studies that show the overwhelming benefits to cardio- vascular, joint, brain, and skin health by taking fish oil daily. 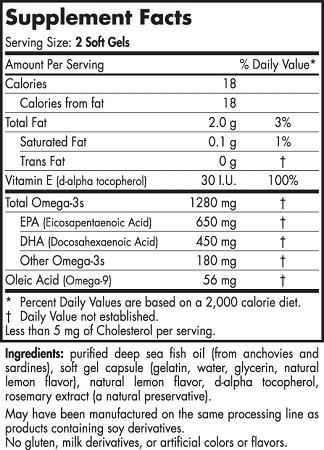 It is ideal for meeting the American Heart Association recommendation of 2-4 grams of EPA/DHA daily for people with elevated triglycerides.